This Thursday 4th April at 6pm PLACE will launch the 'Competitions in Architecture' exhibition. Exploring the theme of architectural competitions and their contribution to quality in architecture, this exhibition highlights a selection of winning entries from the 11th session of Europan, and built works resulting from past sessions of the competition. Europan is a biennial architecture and urbanism competition for architects under 40 held in over 17 countries in Europe. This exhibition coincides with the launch of Europan 12. See www.europan-europe.eu for details. Curated by Jane Larmour and Patrick Wheeler with PLACE, and the kind co-operation of Europan Europe. Thursday 4th April, 6pm at PLACE, 40 Fountain Street, Belfast. Join Jane Larmour and Patrick Wheeler as they introduce the exhibition and Europan 12. A panel discussion will be held during the exhibition run to explore the value of the architectural competition in contemporary practice. Could the built environment in Ireland be improved by awarding more public work through competition? Panel and date to be confirmed. If you are interested in attending this event please contact janelarmour@hotmail.com. Professor Ian Montgomery, Dean of the Faculty of Art, Design and the Built Environment invites you to a keynote seminar - Sustainable Buildings: The Business Case. With Paul King, CEO of UK-Green Building Council and Danny Kinahan MLA, NI Assembly All Party Working Group on Construction. Thursday 25 April 2013, 5.00pm – 7.30pm. 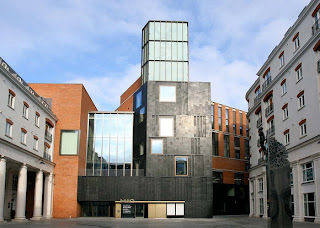 Conor Lecture Theatre, York Street, University of Ulster, Belfast. Registration and refreshments available from 5.00pm to 6.00pm. Tickets are limited - Click here to register. The following was written by PLACE Volunteer and University of Ulster PhD Student Andrew Molloy as part of a critical writing workshop held at PLACE in January 2013. This is a critical article on the MAC, meant as a companion piece to a critique of St George's Church by Andrew, found here. I remember watching the MAC being constructed from the architecture studio of the neighbouring University of Ulster. I distinctly recall the surface of my black coffee shimmering as the building’s piles were driven down into the sleech upon which most of central Belfast rests. I later remember observing the jutting cast concrete forms and, comparing them to the drawings and renders of the building, thinking ‘too complicated, too much going on, too busy.’ In retrospect I see I was becoming ‘Architect,’ and ‘Architect’ could always do better, ‘Architect’ is always cynical. Now the MAC is open I am a regular visitor; be it for coffee with friends, visiting an exhibition in the galleries or informal tutorials and meetings as part of my research. It’s a building I make use of regularly, all of my initial reservations being erased by the elemental act of utility. In mid January 2013 I was lucky enough to be part of a group to receive a guided tour of the building by project-architect and associate of Hall McKnight architects Nigel Murray. This gave me opportunity to sort through my contradicting thoughts. 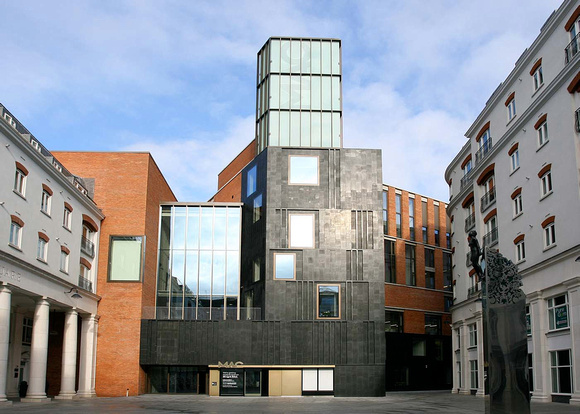 The MAC, Saint Anne's Square, Belfast. This is a critical article on the listed St Georges Church, meant as a companion piece to a critique of the MAC by Andrew, found here. Sometimes I get a peculiar feeling when I walk down High Street. I imagine the Farset bubbling away beneath my feet from it’s source high up in the Black Mountain, now demeaned to flowing through a sewer pipe to join the Lagan. I imagine the broad avenue as it would have been; a dirt track running along the south bank of the stream connecting the motte and bailey of Belfast’s original castle and the ‘Chapel of the Ford’ situated at the sandbank formed by the confluence of the Farset, the Blackstaff and the Lagan, giving Belfast it’s name. We know that the problem of declining town centres and increasing vacancy and dereliction is not unique to Northern Ireland. It's a feature of post-industrial cities, where the displacement of the population into suburbs and commuter belts, the spread of out-of-town retailing, and questionable historic planning decisions converge to challenge the significance and survival of the town centre. So how has this been dealt with in other places that have experienced the same issue? Well, PLACE and somewhereto_NI placement student Senan Seaton Kelly has been on the trail of some of the most inspiring examples, from post-earthquake Christchurch NZ, to New York City, and back to Bristol. Europan 12 launches on 18th March 2013 with 16 participating countries. Europan is a call for projects of ideas at the urban and architectural scale, followed by implementations. It is directed at young professionals of architecture and urban design under 40 years of age and with a European degree or working in Europe. A series of urban sites across Europe, with programme briefs, are proposed to competitors who then chose the site(s) on which they wish to submit their proposal(s). PLACE have partnered with the Graduate Acceleration Programme to offer graduates the opportunity to improve their employability through mentored graduate-level work experience. The GAP scheme is delivered by Business in the Community and supported by the Department for Employment & Learning. For more information on somewhereto_ visit www.somewhereto.com. This is primarily a marketing and communications role with a significant element of youth engagement. You will be promoting somewhereto_, managing the somewhereto_ database, creating exciting new content for social media, liaising with young people and space holders and marketing and managing somewhereto_ events. The somewhereto_ Project Co-ordinator will mentor you throughout the placement to help develop your skills in - event planning, project management, marketing and promotion, communication and team work, arts management and report writing. Essential skills for this position include - excellent verbal and written communication, marketing-related 3rd level qualification, demonstrable organisational skills and a proficiency using IT equipment and software, particularly MS Office. Desirable requirements include - experience of the NI youth sector, access NI check, experience of documenting, evaluating, and creating reports and a proficiency across a variety of social media platforms. This is a graduate work experience position and GAP terms and conditions apply - see www.gapni.com. Contact your local Job Centre or Jobs and Benefits Office to determine eligibility and to make the necessary referral arrangements. For further information contact the GAP team on graduates@gapni.com or call (028) 9046 0606.
opportunity to introduce a new series that explores the experiences of women working in the often male-dominated professions of the built environment. With their emphasis on phallocentric structures and ‘master-plans’, these professions can appear inherently macho, which, along with persistent and pernicious beliefs about the spatial perception of women compared with men, can make carving out a career in this field a challenge for many women. And this is before we begin considering the imbalance in how domestic and childcare obligations are distributed between men and and women within many households, and the impact this can have on career progression. The gender divide is particularly pronounced in Britain and Northern Ireland. In the introduction to her 2009 book Full Irish: New Architecture in Ireland, Sarah Lappin points out that the 11-13% female membership of RIBA compares rather unfavourably with the Royal Institute of the Architects of Ireland’s 30%. So, how is this experienced by women who study and work in these professions? Do women find they have to work twice as hard to be considered half as good as their male colleagues, as we hear echoed so frequently across many industries? Do women have to play by rules set by men, or can they pursue fulfilling careers on their own terms? And what is the implication of gender inequality on the output of professional work - does the underrepresentation of women in the planning, designing, and construction of our built environment have an impact on the shapes and styles of our towns, our cities, our homes? Today, opening the discussion and reflecting on her personal experience as a professional architect, and offering practical suggestions for bridging the gender gap, is Tara Florence of Ard Ciaran Mackel Architects. Rocked to sleep as a child to sounds of Three Point Creek in rural Alberta, at the foot of the Rocky Mountains, my mother instinctively set my life course to be one that would challenge the roles women had been given in this world, as her mother had with her. Alberta was a province of ranchers and oil men, and one which often paid lip service to gender equality but fell far short in reality.